Home Interiors & Gifts Inc. is rcalling about 300,000 fund-raising candle tins. The candle flames could flare up out of the tin container during use, posing a fire and burn hazard. There have been ten reports of candles flaring up. Some surfaces where candle tins were placed were scorched by these candles. No injuries have been reported. The recall includes 6.5 ounce, individually packaged candle tins that are 3-1/4 inches wide and 2 inches tall with an approximate burn time of 35 hours. The lidded tins are silver with fragrance name labels on the side. Fragrances include Sandalwood, Suede, Mulberry, Seaside Breeze, Hawaiian Delight, Carrot Cake, Fresh Peach, Baked Apple Pie, Vanilla Crme and Lemon Torte. The tins were sold at Home Interiors fundraising programs and through direct sales associates from April 2005 through May 3, 2005 for $8. Consumers should stop using the recalled candles immediately. Consumers with the recalled candles should go to the firms Web site at www.homeinteriors.com and click on the candle tin recall for instructions on how to return the candle tins free of charge. Consumers without Internet access can call the firm directly at the toll free number listed below. Information will be available as of Friday, May 27, 2005 via the Home Interiors website and the toll free number. For every candle tin returned, consumers will receive a replacement Home Interiors Candle Tin of the same fragrance and also one of Home Interiors fragranced body care products. Consumer Contact: For additional information, contact Home Interiors at (877) 707-8842 between 9 a.m. and 5 p.m. CT Monday through Friday, or visit the Web site at www.homeinteriors.com. A problem related to the Kia Sedona's rear hubcaps can cause a crash, the National Highway Traffic Safety Administration said. It issued a recall of more than 37,000 Kia Sedonas, model years 2003 through 2005. On certain minivans equipped with alloy wheels, moisture can accumulate around the rear hub caps causing damage to the outer wheel bearing. If this occurs, it could cause a crash without any warning. Dealers will replace the rear hub caps and will begin on June 6. Owners can contact Kia at1-800-333-4542. Apple is recalling rechargeable batteries for iBook G4 and PowerBook G4 computers. An internal short can cause the battery cells to overheat, posing a fire hazard to consumers. The recall affects about 128,000 units in the United States. Apple has received six reports worldwide of batteries overheating, including two reports in the United States. The recalled lithium ion batteries are used with the following computers: 12-inch iBook G4, 12-inch PowerBook G4 and 15-inch PowerBook G4. The recalled batteries include those with model numbers A1061, A1078 and A1079 and serial numbers that begin with HQ441 through HQ507 or 3X446 through 3X510. Consumers should remove the battery from the computer to view the model and serial numbers labeled on the bottom of the unit. No other PowerBook or iBook batteries are involved in this recall. National and regional resellers, catalogers, and Apples online and retail stores sold the computers with the batteries from October 2004 through May 2005 for between $900 to $2300. The batteries also were sold separately for about $130. Consumers should stop using the recalled batteries immediately and contact Apple to arrange for a replacement battery, free of charge. After removing the recalled battery from their iBook or PowerBook, consumers should plug in the AC adapter to power the computer until a replacement battery arrives. Consumer Contact: Contact Apple at (800) 275-2273 between 8 a.m. and 8 p.m. CT Monday through Sunday or log on to Apples web site at www.apple.com/support/batteryexchange to check your batterys serial number and apply for a replacement battery. Carter Brothers Manufacturing Co. is recalling about 9,000 Fun-Kart Go-Karts. The wheel could separate from the go-kart, posing a roll-over hazard. The recall includes one-seater models 1136-3020, 1136-3021, 1136-3420, 1136-3421, 1205-3020 and two-seater models 2336-3021, 2336-3022, 2336-5019, 2575-3020, 2575-3420, 2605-3416, 2605-3515, 2606-3016, 2606-3017, 2606-3416, 2606-3417, 2636-3016, 2636-3017, 2906-3015, 2906-3016, 2906-3017, 2906-4015, 2906-4016, 2906-4017, 2909-3015, 2909-3415, 2909-4015, 2910-3015, 2910-3016, 2910-3415, 2910-4015, 2910-4016, 2910-4415, 2911-4015, 2911-4016, 2946-3015, and 2946-3016. The model number and serial number is located under the seat (on the drivers side if two-seater). The Fun-Karts were produced in several colors to include red, black, blue, purple and green. The units were sold by Carter Brothers dealers nationwide from April 2003 through March 2005 for between $900 and $2,900. Consumers should stop using the recalled Fun-Karts immediately. Registered owners of the vehicles will be notified directly by Carter Brothers about the recall. Consumers can call or visit their local Carter Brothers Dealer to schedule a free repair. Consumer Contact: For more information, contact Carter Brothers at (800) 523-5278 between 8 a.m. and 5 p.m. CT, or visit their Web site at www.carterbro.com. Polaris is recalling about 14,000 snowmobiles. The fuel tank filler neck may develop a crack at the base where the filler neck meets the fuel tank assembly. This may cause the neck to separate from the fuel tank assembly and allow fuel to escape from the tank, potentially creating a fire hazard. Polaris dealers sold these snowmobiles nationwide from July 1, 2003 through May 1, 2005 for between $4,099 and $9,999. Free repair is offered. Contact your Polaris snowmobile dealer to schedule an appointment for the fuel neck reinforcement kit installation. If your Polaris dealership finds the filler neck cracked, your dealership has been instructed to replace the complete fuel tank assembly. 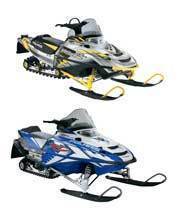 Polaris has notified registered affected consumers directly about this recall. Consumer Contact: Call Polaris at (800) 765-2747 between 8 a.m. and 12 midnight ET seven days a week, or log on to the companys Web site at www.polarisindustries.com. Robert Bosch Tool Corp is recalling about 69,000 BOSCH Circular Saws. The lower blade guard can malfunction, creating a risk of injury as severe as amputation. The firm has received three reports of malfunctioning lower guards, including one amputation. The recall circular saws include the BOSCH CS10, CS20 and CS20-XC models, which can be identified on the product nameplate mounted on the top of the motor housing. The recalled models do not have an asterisk (*) in the serial number box. The circular saw uses a 7-inch blade and has a blue handle and motor enclosure, and a metal guarding system. The name BOSCH is printed on the blade guard. The saws were sold at Home Depot, Lowes and Menards nationwide, as well as independent hardware retailers and industrial distributors, from February 2004 through April 2005 for between $120 and $150. Consumer should stop using the circular saws immediately and contact Robert Bosch Tool Corp. to receive a repair kit. The kit includes hardware and instructions for installation. Consumer Contact: Robert Bosch Tool Corp. at (800) 856-9683 between 7 a.m. and 7 p.m. CT Monday through Friday or visit the BOSCH Web site at www.boschtools.com. Ethan Allen is recalling about 7,000 American Impressions and New Country rectangular dining tables. These tables can be missing stability blocks that could result in the table collapsing. Ethan Allen is aware of 33 incidents of tables collapsing where a table may have been missing sufficient stability blocks. Ethan Allen is not aware of any injuries caused by a table which collapsed. The tables were sold at Ethan Allen stores nationwide from August 2003 through January 2005 for between $1,069 and $1,199. Consumers should stop using the dining table and inspect the underside of the table. Consumers who purchased a recalled table are asked to contact the Ethan Allen Recall Center. Ethan Allen will schedule a service appointment and take corrective action. Consumer Contact: Ethan Allen is sending letters to all known customers of these dining tables. For more information, contact the Ethan Allen Recall Center at (888) 339-9398 between 8:30 a.m. and 4:30 p.m. ET Monday through Friday. Consumers also can contact Ethan Allen on their Web site at www.ethanallen.com. Pamela Drake Inc. is recalling about 7,000 Lemon Meringue wooden push toys. Small parts can break off posing a choking hazard to young children. The recall includes six different multi-colored, solid wooden push toys, including an airplane, tractor, dump truck, fire truck, and a two-piece circus train with train cars and a tow truck with family van. The vehicles are constructed with a bendable flap that allows the toys to wiggle back and forth. The dump truck, circus train with train cars and tow truck with family van have white magnets on the front and back to hold the push toys together. All the toys have rubber rings on the tires. The recalled push toys are intended for children 12 months and older. There is no writing on the push toys. The toys were sold at toy and hobby stores nationwide from February 2005 through March 2005 for between $15 and $24. Consumers should immediately take these recalled push toys away from young children and return the toys to Pamela Drake Inc. or their local retailer for a full refund. Consumer Contact: Call Pamela Drake Inc. at (800) 966-3762 between 8 a.m. and 6 p.m. PT Monday through Friday, or visit the firms Web site at www.woodkins.com. Fisher-Price is recalling about 154,000 Grow-To-Pro Pogo Sticks. An internal metal pin can wear down, causing the pogo sticks to remain stuck in the down position and release unexpectedly, posing a risk of fall or facial impact injuries to children. Fisher-Price has received 17 reports of incidents with the pogo sticks, including one report of two teeth being lost and one report where stitches were required. Other injuries involved cuts and bruises to the face, arms and legs from fall injuries. The recalled pogo sticks are traditional pogo sticks with a round, removable base, two foot pegs and handles and the words Grow to Pro Pogo stamped on the front of the product. They come in two colors: green (model number 73386) and pink (model number 77356). The model number can be found underneath the pogo sticks foot pegs. This recall includes green pogo sticks manufactured through August 1, 2004, and all pink pogo sticks. Green pogo sticks manufactured after August 1, 2004, are not included in this recall and are marked with a round, green sticker underneath the foot peg. Pink pogo sticks are no longer manufactured. The pogo sticks were sold by discount department and toy stores nationwide from January 2002 through August 2004 for between $25 and $30. Consumers should take the products away from children immediately and contact Fisher-Price to receive a free replacement pogo stick. Consumer Contact: Contact Fisher-Price at (800) 991-2444 anytime or visit the firms Web site at www.service.fisher-price.com. Jake's Fireworks is recalling about 75,000 24-shot Excalibur Reloadable Artillery Shell Kits. The aerial shells are fused, shaped, and labeled in a way that could cause consumers to unintentionally place them into the launch tube upside down, resulting in a ground-level explosion. Such an explosion can cause serious injuries to consumers in close proximity of the device. There has been one incident where a consumer inadvertently placed an Excalibur shell inside a tube upside down. No injuries were reported. These 24-shot Excalibur Reloadable Artillery Shell Kits are sold in a black box with plastic windows. The shell kits are a consumer fireworks device that consists of a black plastic launch tube and twenty-four display shells in a display box. 24 shot Excalibur Reloadable Artillery Shell Kits and World Class Fireworks are written on the front of the display box. Only the model 24 shot Excalibur Reloadable Artillery Shell Kits are included in this recall. They were sold at fireworks retailers, including display stands and tents in states permitting the sale of consumer fireworks, from Winter 2003 through Winter 2004 for about $30. Consumers should stop using the fireworks immediately and return the entire device to the store where purchased for a full refund or contact Jake's Fireworks for further instructions. Consumer Contact: Call Jake's Fireworks Inc. at (800) 766-1277 between 8 a.m. and 5 p.m. CT Monday through Friday, or visit the firms Web site at www.jakesfireworks.com.